Can you write an entire book about a single chart? Even if that chart is supposedly the best one ever? 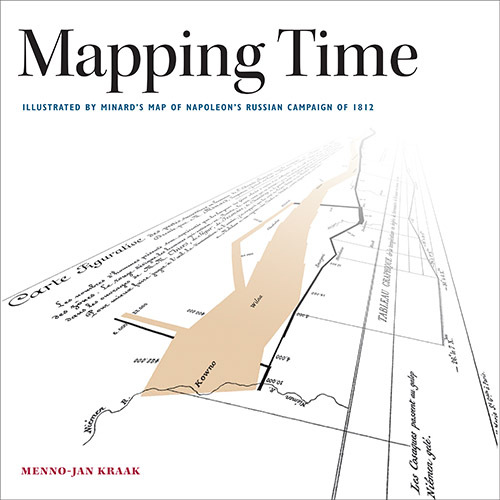 Menno-Jan Kraak’s new book, Mapping Time: Illustrated by Minard’s Map of Napoleon’s Russian Campaign of 1812, discusses the historical context of Minard’s work, his, life, and walks through a number of design exercises to show the same or similar data in different ways. The graphic, which Tufte says “may well be the best statistical graphic ever drawn,” is also often referred to as Napoleon’s March. It depicts the size of Napoleon’s army during the Russian Campaign of 1812, which Napoleon began with over 420,000 men, and ended with only 10,000. Kraak has something of a personal connection to the graphic, because a brother of his great-great-grandfather, Gerrit Janz Kraak, fought in the Russian Campaign and died in the Battle of Berezina. That gives some structure to the book and provides a focus on that particular battle. That makes sense too, since it was the one where Napoleon lost the half his remaining men during a two-day battle. The writing is generally clear and concise. The format of the book is of the coffee-table variety, which is a bit odd for its content. It does give Kraak the room for a very well-designed and laid-out book, though: text generally refers to images on the same or facing page, and few paragraphs break across pages. There is a lot of additional historical context that goes beyond anything I have seen so far. That is true both for Minard’s background and earlier work, as well as the Russian Campaign. Kraak also clears up a few misunderstandings, including the losses at Berezina. Many accounts have his men fall through the ice, when the problem actually was that it wasn’t nearly cold enough for ice cover and bridges had to be built. After the description of the graphic and its background, Kraak broadens the scope to talk about how to depict time and space in maps. That discussion always uses the data points from Minard’s chart as the example, and thus stays very well focused. Some of the techniques are more interesting and illuminating than others. In particular, I find the space-time cubes to be largely ineffective, and the same goes for cartograms. But some of the other maps help see some aspects of the data more clearly, like the speed of the army and the time spent in different places. While I appreciate a self-confident writer, I find him to be a bit too certain that Minard would have found his analysis useful (p. 94). It’s certainly possible, but all signs point to Minard having a very specific message in mind, and all the added data and complexity would have taken away from that. Kraak acknowledges the message at one point, but never seems to wonder if his exercises would have actually furthered Minard’s goals. What is striking is that none of the reworkings and variations approach the elegance and effectiveness of the original. That is also true of Michael Friendly’s collection of Re-Visions of Minard, which are all terrible (that is not Friendly’s fault, to be clear, he only collects them). Some of Kraak’s exercises also provide context that is irrelevant or misleading, like putting the diagram on top of a contemporary map (too much information), a recent satellite photo (irrelevant), or a recent map (misleading). In many cases, there is simply too much information, like lots of troop movements of the different corps of Napoleon’s army, which don’t help illuminate the story without a lot of additional context (i.e., why did they occur?). Kraak is simply too focused on the mapmaking part, and doesn’t consider the importance of making a point (though he acknowledges Minard’s intent). That is understandable, since it’s the typical approach in visualization and very common in cartography to go after analysis. But that doesn’t seem to be what Minard was trying to do. This is also clear in his final reflections on whether the map really is the best one ever, which get tangled up in the discussion of other techniques and additional data, when it’s really a matter of expressing a point through data. While it is easy to criticize each individual approach to depicting the data in a different way, they all illustrate what makes that particular graphic such a classic. The book provides an appreciation of the graphic and a world of context around it. Sometimes, it’s important to see many bad variations to understand why a particular original is so good. All of that does not take away from the amazing amount of context that Kraak adds to the discussion, and alternatives that he points out. The book also works as an introduction to cartography and visualization, based on Bertin’s principles, when it builds up maps from layers and discusses different encodings for the data. It even goes beyond the usual approach by showing bad examples and why they are not successful. That makes this book successful not just as a description of one of the most famous graphics, but also useful as a learning tool. Now somebody needs to write a similar book about Nightingale’s chart. Menno-Jan Kraak, Mapping Time: Illustrated by Minard’s Map of Napoleon’s Russian Campaign of 1812. Esri Press, 2014.